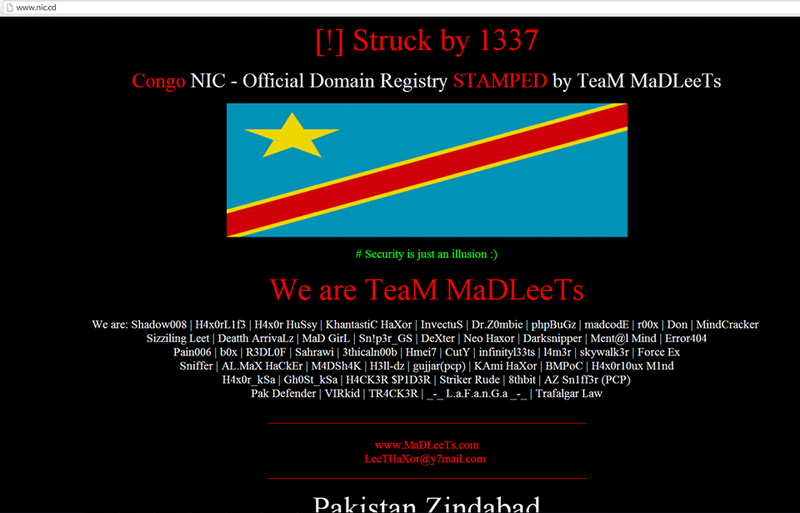 Once a popular hacker "Leet" from Pakistani hacker team "Madleet" have back into the cyber world with its hack. This time also hacker have hacked and deface the some of the high profiled site. Today hacker LEET have hacked the Domain Registry of Democratic Republic of the Congo (nic.cd). Domain Registry of Democratic Republic of the Congo (nic.cd) is responsible for providing all the high profiles local countries domain for the firms as like Amazon, Microsoft, Godaddy and so on. Hacker have hacked into the system of the domain registrar and able to change DNS of all the site hosted on the server to its own DNS. Earlier also hacker have hacked numerous high profiled site which includes, domains of Google, Microsoft, and many of NIC domains with the same method called DNS poisoning. At the time of writing all the sites are still showing the deface page. You all can check the list of the site deface and its mirror on the Zone-H.